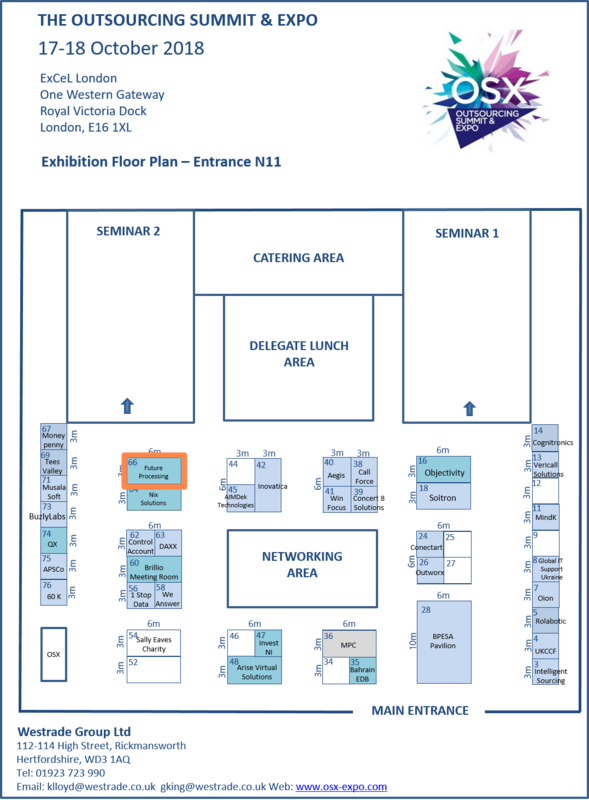 On 17th and 18th of October 2018 we are exhibiting at booth 66, at ExCel London during the Outsourcing Summit & Expo (OSX). This event is the premier destination for sourcing industry and IT professionals to connect, collaborate and create the future as it brings national ITO and BPO leaders to deliver everything you need to know about outsourcing. A full-on 2-day programme has been carefully designed to deliver opportunities for sourcing and IT professionals at every level to participate, learn, network and build new alliances and partnerships that will transform their businesses. Digitalisation, AI, Augmented Reality, and the ever-rising expectations of a hyper-connected customer have forced the global sourcing ecosystem to pivot dramatically over the last few years. Everyone throughout the sourcing ecosystem must rethink how they do business. So, in the face of such tectonic change, how do you identify new opportunities to collaborate, access innovative technology and the experts that provide it? If you’re looking for the answer to this particular question, make sure not only to pass by our stand. It may also be worth your while to listen to our CEO, Jarosław Czaja, on Wednesday (first day of the conference) at 12:00 pm in ITO panel as he will be talking about implementing innovation in the age of skills shortage. Jarosław will explore the issue of talent shortage in highly innovative competencies and will show you what to look out for when searching for an IT partner to unlock innovation. Feel free to share your thoughts on Jaroslaw’s lecture and other topics covered at our stand. Come and meet us to learn more about exceptional software services we provide. At Future Processing, we pride ourselves on the high level of technical expertise and we are pleased to be able to share it at the event as one of our technical experts and a Business Analyst with knowledge of UX will be available at the stand to answer all your questions and share their expert knowledge. Visit stand 66 for free, speed-consulting in order to receive guidance on your specific problem from one of our best technical or business experts. Moreover, we will offer free tools to speed up the process of choosing the best outsourcing partner. Just come to our stand and mention the toolkit to one of our representatives. We will be waiting for you – don’t miss it! Previous postEmployer Branding in IT – an answer to IT talent shortage?